- OD -3" to 24"
Rockwell Hardness : 20HRC, 25HRC, 30HRC, 35HRC, 40HRC, 45HRC, 50HRC, 55HRC, 60HRC. We are a prominent manufacturer and supplier of an extensive range of superior quality Pin Bush Type Couplings. 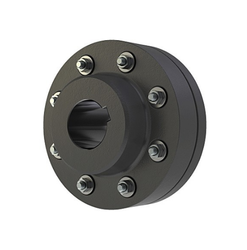 The offered couplings take care of a reasonable amount of angular and parallel misalignment of shafts. High quality steel is brought into use for manufacturing the offered range following industry set guidelines. With the help of our expert team members, we have been able to providePin Bush Coupling. We have also been betrothed in providing for our clients, Pin Bush Coupling. Our company holds vast experience in this domain and is involved in the offering Pin Bush Coupling. Backed by a rich industrial experience, we are engaged in offering a commendable array of Pin Bush Coupling. 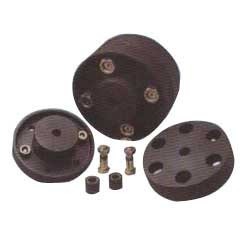 We specialize in offering Pin-Bush Couplings (SFB Series) that are highly appreciated for these can transmit torque through the high tensile steel bolts. These couplings are characterized by high absorbing power of stock loads and anti corrosiveness. Moreover, these are highly acclaimed in the industry as these are available in various specifications.